NMMC Staff Nurse Recruitment 2018: Navi Mumbai Municipal Corporation (NMMC) is going to fill up the 448 Staff Nurse/ Nurse Midwifery, fireman, Driver etc. vacant Posts. All interested and eligible candidates are invited for the NMMC Staff Nurse Recruitment 2018 and can fill the application form via online mode on or before the last date i.e. 21st September 2018. Every year NMMC Department releases huge numbers of vacancies for the unemployed candidates and gives the chance to make their secure future. From Here, you can get all latest update about the Government Jobs. For more details such as Eligibility Criteria, Application Process, Age Limit, Application Form, Selection Process, how to fill the application form and other information read complete article. Go to the www.mahapariksha.gov.in Official Website. Click on the Advertisement for Navi Mumbai Municipal Corporation Health and fire Department Examination 2018 link. A new page will be open where you can see the Advertisement section. Open Navi Mumbai 2018 Notification and go through all the details. From the same page click on the Registration Link. Complete the Registration Process and Log in with registration ID and Password. Fill all the required fields with genuine information. Click on the submit button and submit the application. Take a print out of the NMMC Online application form and bring it at the time of interview. Candidates must note down their ID & Password for future use. Remarks: Get full details from our website i.e. www.jobs.chekrs.com. 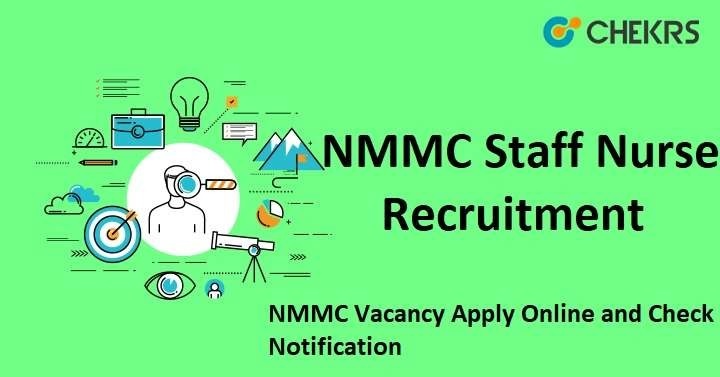 In the case of any query about NMMC Staff Nurse Recruitment 2018, you can put your comments in the commenting section below and we will revert you in a short while. You can also bookmark our page and get the latest alert on Medical Jobs.